I commend Mario Draghi and the ECB for their openness in hosting this conference and allowing the presentation of so many perspectives. In the spirit of that openness I shall offer some iconoclastic observations.For the last quarter-century, there has been a consensus in favor of macroeconomic models that largely divorce issues of potential and cyclical performance. The consensus affects – and I would argue infects – both academic macroeconomics, and more importantly, central banking practice. It is the central premise behind inflation targeting, and central bankers – essentially without exception – assert that they have the capacity to affect or even determine inflation in the long term, but that they do not have the capacity to affect the average level of output, much less its growth rate over time, even though they may have the capacity to affect the amplitude of cyclical fluctuations. It is understandable, given the experience of the 1970s, that this consensus formed. Two percent of Harvard freshmen find themselves alcohol-poisoned and in the hospital in the first month each September. In the same way, the world went badly wrong in its first experiment with purely fiat money in the 1970s and produced high inflation to little economic benefit and considerable cost. The experience lent strong support to theories of monetary neutrality and with a lag to the idea that dynamic consistency issues were central in thinking about inflation. What followed around the world was a consensus maybe even an obsession with the idea that central banks should be independent and that rules rather than discretion should guide policy. My thesis this morning is that the pendulum has swung much too far regarding monetary neutrality, central bank independence and the dangers of discretion. While monetary policies are surely not determinative of long-run outcomes, they can, and in some cases do, have major effects on average levels of output over periods of decades. Moreover, the failure to well-integrate monetary policy-making with other areas of policy has had substantial pernicious effects. And the world is too unpredictable for simple feedback rules to be sound guides for monetary policy. An analogy makes one aspect of my point. I was told recently by someone who is very knowledgeable that the most important question in assessing the health of an aged person is “have you had a fall in recent months?” If you have, that is very bad. Scholars can and do debate whether people who have fallen were hurt by their fall, or whether their fall was a symptom of neurological difficulty. They can and they do debate whether the fall hurts a person or whether the fall sets off a process of ongoing deterioration. But there is no division of opinion on the question of whether or not it is desirable to do everything possible to prevent falls. There is no division of opinion on whether it is desirable to do everything possible to cushion falls when they occur. And there is no division of opinion on the question of whether it is best to get people moving again as rapidly as possible after their falls. I would suggest on essentially the same grounds that it is appropriate in macroeconomic policy, and in particular in monetary policy thinking, to focus on two strands of economic theory – that associated with hysteresis and that associated with secular stagnation. Both pertain to the economic equivalent of falls—shocks that can have long lasting adverse effects on economic performance. I thought it would be my purpose here to briefly rehearse the evidence that hysteresis effects are important. Given that close to 90% of the attendees at this conference have just concluded that there are hysteresis effects in which recessions permanently affect output levels or superhysteresis effects in which they affect rates of growth, I will take the likelihood of hysteresis effects as stipulated. I understand how, on grounds of counter-causation and a variety of other arguments, one can argue that the case for hysteresis effects is unproven. That would not be my reading of the evidence, but I understand as a matter of logic how that case can be made. I do not understand how one can accept the reality of hysteresis effects as important and deny that their presence has very substantial implications for the conduct of monetary policy. I do not understand how one can fail to recognize that if hysteresis is important, it is desirable to move as aggressively as possible – even at some inflation risk – to contain recessions when they start. And importantly and relevantly for current policy debates almost everywhere, I do not understand how one can fail to recognize that there is a major asymmetry suggested by hysteresis effects in which inflation below target is far more costly than inflation above target. Inflation above target has the distortions associated with excessive inflation, mitigated by the fact that the path that got you to inflation above target has some hysteretic benefits going forward for output. Inflation below target, on the other hand, has the distortions associated with sub-target inflation, plus the permanent or semi-permanent output cost that one could avoid by doing what was necessary to push inflation up to target. I would just conclude this part of what I have to say by noting that some years ago, Brad DeLong and I wrote a paper about fiscal policy and the implications of hysteresis for fiscal policy. We defined in that paper a parameter that we called η (pronounced eta). η essentially was the answer to the question, if you have an extra 1% of recession in year T, how much lower will potential output subsequently be? We concluded that if you had hysteresis effects on the order of 0.1 – that is 1% less output meant a tenth of a percent less potential output – those would have profound effects for questions like whether fiscal policy paid for itself. If you take the empirical estimates of Olivier [Blanchard] and myself seriously, or you take Jordi [Galí]’s empirical estimates seriously, they suggest η parameters that are 10 times that large. I would not be surprised at all if further work refines downwards our estimates of hysteresis effects. But I would be very surprised if it was revised downwards far enough so that they did not have profound implications. That brings me to the closely related, but also clearly distinct, issue of secular stagnation. Secular stagnation and hysteresis obviously have the chance to reinforce each other. Ian economy s stagnant forgone reason, that leads to hysteresis effects. The prospect of slower growth then leads to further pressures for stagnation. In a sense a kind of inverse Say s law can take hold. Lack of demand creates a lack of supply. In this regard it is worth noting as Figure 1 illustrates that all of the progress the United States has made in closing its output gap since 2009 is the result of reductions in estimated potential. The thesis of secular stagnation is essentially this: because of a chronic, incipient excess of saving over investment, there will over time be a tendency for growth to be sluggish and real interest rates to be low – but perhaps constrained above the levels that would be necessary for a full employment equilibrium. Or, at a minimum, rates are forced to levels that raise questions about financial stability because of the implications that very low interest rates have on risk-taking and various other effects that contribute to financial bubbles. From the perspective of secular stagnation theory, much of what people worry about in monetary policy is endogenous rather than exogenous – such as zero rates, conditions that give rise to negative long-term rates, decisions to expand balance sheets. These are not exogenous acts. These are necessary responses to insufficient employment and to deflationary pressure created by the excess of saving over investment. In the presence of these excesses, monetary policy has no attractive choices. The determined pursuit of financial stability will put at risk the achievement of full employment. The determined pursuit of full employment and adequate product price inflation will put at risk the objective of financial stability. Central bankers then have a major stake for the achievement of their basic goals in the remainder of economic policy. The best way to aid the central bank will depend on circumstances. In Europe, it seems to me that the preponderant secular stagnation solution needs to be structural reform. Quite apart from the traditional virtues of structural reform, it offers the prospect of creating the legendary new frontier of attractive investment opportunity that will raise equilibrium real interest rates and make possible the achievement of full employment at interest rates that are conducive to financial stability. There is also a strong case, where there is room, for fiscal expansion, particularly in those countries that are running large and substantial current account surpluses. In the United States, there is also substantial scope for structural reform, but in my judgment, the larger deficiencies are with respect to the lack of public investment. It is indefensible – on grounds of microeconomics, macroeconomics, or common sense – that at a moment of record low capital costs and substantial construction non-employment, the share of public investment is at a record low. And anyone who flies into Kennedy Airport knows what I mean. I’ve been saying this for a while, and what I figured would eventually happen did happen. The person who was in charge of Kennedy Airport called me to get me to stop. He knew he wouldn’t get me to stop without giving me a different story, and so he did give me one, which is that the air traffic control system in the United States of America is based on vacuum tube technology. Nobody under 60 can repair it. It has inadequate capacity. And when it gets really crowded over the New York area, they move to a different backup technology – yellow stickies on an oak bulletin board. That is not as it should be. It makes microeconomic sense, macroeconomic sense, and combats secular stagnation to fix it. A final thought. Some of you will have noticed that there’s been what people have described as a blog battle between Ben Bernanke and myself, in which I am said to be an advocate of the theory of secular stagnation and Ben is said to be an advocate of the theory of the savings glut. They are the same thing. They are the same idea – an excess of saving. The point which Ben very appropriately emphasizes is that unmanaged secular stagnation in one place is contagious – that a higher level of saving over investment leading to low interest rates in one place, leads to current account surplus, leads to a capital outflow, which then leads to currency depreciation, leads to currency appreciation in other places, and leads therefore to spreading low demand and low interest rates everywhere. Secular stagnation is a contagious malady. It is the obligation of those who have it to fix it. It is the right of those who are exposed to the contagion, to encourage those who are the source of the contagion to act to respond to it. That is not a call for easier European monetary policy. Easier European monetary policy might or might not be availing in Europe, but it would, through the mechanism I just described, increase the extent of contagion. It is a call, as a matter of urgency, for other actions in Europe that operate to increase equilibrium real interest rates and to stimulate economic growth. These arguments may or may not be precisely correct, and I put them forward in the spirit of provocation and to stimulate discussion. But of this, I am nearly certain – to understand the problems of this moment, we need to move beyond the idea that monetary policy is only about the second moment — the extent of the variability of output — and recognize the profound consequences of monetary and financial policy debates for living standards over time. Thank you very much. The Centers for Disease Control has a section of its website devoted to fall prevention and recovery, http://www.cdc.gov/HomeandRecreationalSafety/Falls/index.html. Delong, J. Bradford, and Lawrence H. Summers. 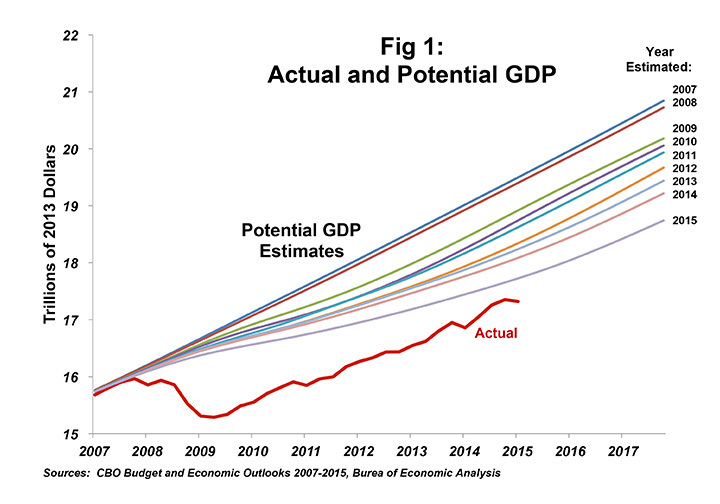 “Fiscal Policy in a Depressed Economy.” Brookings Papers on Economic Activity, Spring 2012. Olivier, Blanchard, Eugenio Cerutti and Lawrence H. Summers. “Inflation And Activity.” ECB Forum on Central Banking, May 2015 preliminary. Galí, Jordi. “Hysteresis and the European Unemployment Problem Revisited.” ECB Forum on Central Banking, May 2015. Summers, Lawrence H. “Demand Side Secular Stagnation.” American Economic Review, 105(5): 60-65. May 2015. See http://www.brookings.edu/blogs/ben-bernanke/posts/2015/03/31-why-interest-rates-low-secular-stagnation for Bernanke’s post on secular stagnation and http://larrysummers.com/2015/04/01/on-secular-stagnation-a-response-to-bernanke/ for my response.